Animal Facts Club Presents is an educational, artistically innovative short series about science. It blends large-scale sets, puppetry, animation and choreography with documentary segments. 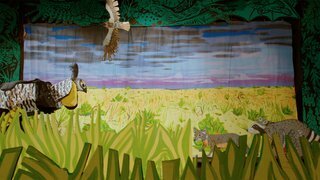 Endangered Rituals focuses on the nearly extinct Attwater Prairie Chicken and the critically endangered Houston Toad who both have incredible mating displays. Animal Facts Club is a consortium of artists that celebrate wildlife through live performance, video, painting andmore. Rachel Bardin joined founding members Jules Buck Jones and Audrey Stewart to create a series of shorts based on their live production the Biodiversity of Texas. Bardin is a director whose documentaries have screened and won awards at festivals including the Austin FilmFestival, Flyway Film Festival and IFFBoston. She recently graduated from the MFA Film Production program at the University of Texas at Austin. Jones narrates, performs and creates art for the films. He has exhibited in galleries and been invited to residencies across the United States. He is a founding member of MASS gallery in Austin and currently teaches at Texas State University. Stewart is the lead researcher for the series and original writer of the live performance. She earned her B.S. and M.A. in Ecology, Evolution and Behavior from the University of Texas at Austin. Read the full Q&APBS spoke with Filmmakers Jules Buck Jones and Rachel Bardin about their inspiration for the puppetry, costumes and set designs behind this whimsical film. PBS: This film introduces us to the Attwater Prairie Chicken and the Houston Toad. Though film weaves live footage of both of these animals throughout the narration, there’s a large use of puppetry to depict these animals. What was the inspiration behind this? Jules Buck Jones: The original performance, called “The Biodiversity of Texas,” used puppets and costumes as the main visual vehicle. These were live performances, where the puppets were accompanied by narration and sound effects. Rachel Bardin: The puppets bring out the sense of awe and wonder that we get in the presence of wildlife. The artwork and performances by Jules show enormous reverence for the animals because he has studied them so carefully. I wanted to create these connective moments in the film which bring us out of the dream of the puppet world to seeing the animals themselves. Dedicated to showcasing Indie films all year round. PBS is everywhere you are. Enjoy the show on your favorite streaming device.